The deeds to these two properties provide some insights into the social history of Bingham in the last half of the nineteenth century. The land was originally part of the Shelford Estate, owned by the Earls of Chesterfield and latterly through marriage by the Earls of Carnarvon. The land was part of that held by the King's Arms public house, later to become the Crown. The Earl of Chesterfield sold the plot occupied by number 4 in 1852 to John Wesson, a shoemaker who had already built a house and shop on the land, presumably as a leaseholder. Whites trade directory of 1844 lists Wesson as a shoemaker in the Market Place so he must have built the property sometime between 1844 and 1852. He acquired the next-door plot, to build number 6, in 1855, taking out a mortgage in 1860 to cover the cost of having built it. He rented No 6 to a clock and watchmaker named John Rayson, who is recorded as already in occupation at the time of the mortgage. Rayson's son William had taken over by 1861. The census of 1871 shows an inland revenue officer as occupying number 6. By 1879 the Rayson's had moved to Church Street where he traded. Mrs Rayson is listed in 1891 as offering 'apartments' in Church Street. Wesson was continually mortgaging the properties to raise funds and in 1864 had two mortgages running concurrently, one for £400 and one for £270. He was clearly in financial difficulties and was also getting old (he was 79 in 1891). By 1887 Bedford Skinner Hitchcock had taken over the boot and shoe making business whilst Christopher Cullen was now watch making next door. One can only speculate that Bedford was related in some way to Wesson, as Wesson became his boarder in retirement. In 1892 Bedford bought both properties and by this time his son Edwin Hitchcock was watch making next door. In 1903 Edwin Hitchcock moved to 1 Market Place. Bedford took out various mortgages over the next few years and eventually sold number 4 to his other son Fred Hitchcock in 1920, who also took over the mortgage. Bedford's daughter married a Scothern and took ownership of number 6. She rented it to the proprietor (Mrs Morris) of a sweet retailing business. Fred borrowed smaller sums over the years against the property and in 1938 Annie Alice Hitchcock settled the outstanding mortgages, presumably on his death. As Annie Alice Miles she sold number 4 in 1972. We do not have the later history for number 6. Thus number 4 was a boot and shoe makers for probably well over eighty years and number 6 a watchmakers for most of its first sixty. The shop fronts to both were still evident in 1974, but both are now converted to private residential use. The papers for 1860 and 1892 reveal interesting sidelights on the way the law operated with respect to married women's property - see body of text below for details. 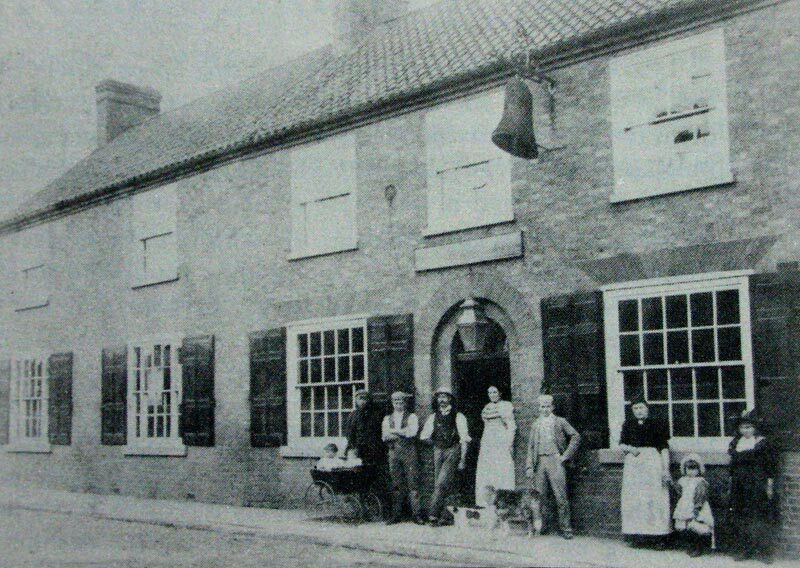 Thus these parcels of land were at that time part of the land farmed by the Kings Arms, perhaps surprisingly not the Blue Bell (photo above) that stood between the Kings Arms and the properties. After reciting the terms of the marriage settlement of the 5th Earl, the Abstract then records a mortgage, dated 1 November 1852 between John Wesson a shoemaker of Bingham and Henry Clayton, in which Clayton lends Wesson £200 at 4¼%. He also charges Wesson rent on the properties of £8.10.0d even though they are mortgaged. (We have come across this before). The plot is described as measuring 232 sq. yds, bounded on the east by premises in the occupation of Rev Robert Miles (the old Rectory), on the west by Chesterfield Street (the former name of Station Street), on the north by land occupied by the Earl of Chesterfield and on the south by premises in the occupation of William Whitworth (the public house mentioned in the 1826 description). For reasons that become clear later, this identifies this mortgage as being in connection with number 4. The mortgage included: "and also that messuage dwelling house and shop with outbuildings and appurtenances erected by the said John Wesson in and upon the said piece of ground and now in his occupation." It is not clear at this stage whether Wesson owned the freehold or leased the land from the Earl. Either is possible, as there are several instances in Bingham of land being leased by the Estate for someone to build on, and then pay ground rent to the Earl. A lease or conveyance is missing. The mortgage dates the house and shop to before 1852. Various trade directories help to be more precise. Kelly's 1855 directory has John Wesson named as a shoemaker but does not give addresses - although clearly from the mortgage he was at number 4. Whites of 1844 have Wesson as a shoemaker but in the Market Place. So the building dates from between 1844 and 1852. Perhaps he was one of the stallholders who were evicted when a poor row of stalls were demolished to allow the building of Vernon House and The Limes (17 and 18 Market Place) about this time. Possible light is shed on the question of tenure by the next document, a mortgage of 8 September 1855, again supplied by Clayton to Wesson, and this time for only £40. It is in respect of land bounded to the south by hereditaments occupied by John Wesson and to the north by the Earl of Chesterfield. This is number 6. This would seem to be to buy the freehold, suggesting that he probably already owned the freehold to number 4. The loan was at 4½% and he paid rent at £4.16.0d pa. Repayment was made a year later. On 18th August 1860 Wesson mortgaged the two properties to George Morley, a farmer of Aslockton. Interestingly, there is a declaration that the money for the advance belonged to Mary Ann Keyworth, wife of Robert Keyworth, malster of Aslockton and that Morley was standing in trust for Mary Ann (she was his daughter as becomes clear in his will - see below). At this time number 6 was already in the occupation of John Rayson so we are probably looking at a build date of around 1859. The principal was £400, which seems a little high just to recoup the cost of building number 6 so perhaps Wesson needed more funds. The relative quality of the two buildings, which one can see were built separately, suggests a later date for number 4, it being better finished with the chequered brickwork similar to Cromwell House opposite. Perhaps he could not afford such quality for the second building, and perhaps he was not bothered since it was to be let to a third party. The census of 1861 lists William Rayson as a clockmaker of Station Street, who was presumably John's son. William was aged 29 so it looks as though John had died in the intervening twelve months and William took over. Certainly William is listed in the 1864 Whites directory. It is interesting to note that in 1861 both households boasted a servant, one aged 14 the other 16. On 25th March 1864 Wesson again mortgaged both properties, to Mrs E Philbrick and Miss Ann Bennett for £270 at 4½%. The document notes that the properties are already subject to a mortgage with Morley, which had not been repaid. Wesson seems to be in real financial straits now. 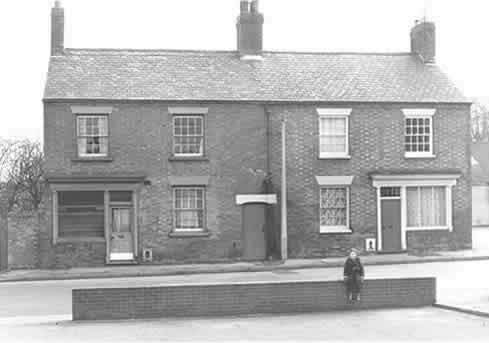 Philbrick was a widow of Sneinton and Bennett a spinster of Sneinton and the deed notes that the mortgage was financed from their joint account. The two properties are in the occupation of Wesson and Mr Raisin (Rayson). Wesson mortgaged everything - furniture, stock in trade and trade effects. Repayment was set for a year hence. The census of 1871 shows the occupants of number 6 as an Inland Revenue officer and his family. The directory of 1879 shows that Rayson had moved his business as watchmaker to Church Street, but Wesson the shoemaker remained in Station Street. In the 1881 census Rayson's widow, Jane, and the family were in Church Street where her oldest daughter Mary was a governess. Two other sisters were there together with two 'scholars' as boarders aged 5 and 4. In 1891 Mrs Rayson is listed as offering 'apartments'. In 1887 Bedford Skinner Hitchcock was listed as a shoemaker of Station Street and Christopher Cullen as a watchmaker and listed as such in the 1881 census. Cullen and his wife hailed from Norfolk; their two children had been born 10 and 11 years previously in Canada. So things are happening! They must have been tenants of the mortgagors (which ones? ), as it is they who technically owned the properties. In the 1891 census Bedford Hitchcock (shoemaker) and now Edwin Hitchcock, his son, (watchmaker) occupy the respective properties. John Wesson, retired shoemaker, is listed as Bedford's boarder aged 79. It is tempting to suppose a relationship, perhaps through marriage, between the two but the census record does not help. Two abstracts of mortgage were drawn up in 1892, one relating to the deal with Clayton and the other with Philbrick and Bennett. They were drawn up by different solicitors, as would be expected, but one wonders whether Clayton knew of the second mortgage. Morley had died on 5 June 1876 appointing John Doncaster (surveyor of Bingham, who appears on many deed documents we have seen) as an executor. Another executor was his son-in-law Robert Keyworth, husband of Mary Ann. It seems to have taken a long time for the properties to be sold after his death to produce funds to redeem the loan. In any event the sale of the properties was agreed on 22 June 1892 to Bedford Skinner Hitchcock, who had clearly succeeded Wesson in the business. He paid £550 for the two, £400 to Clayton's estate and £150 to Philbrick and Bennett who by this time is Mrs John Frost Hollingsworth (who also appears as a party to the conveyance, since a woman's property passed to her husband). Chesterfield Street is crossed out on the deed and Station Street written in, helping perhaps to date this event - the railway had opened in 1850. Number 4 is already in the occupation of Bedford Skinner Hitchcock and number 6 of Edwin Hitchcock. The conveyance has a fascinating endorsement in relation to married women's property. It is written by the "perpetual commissioner for taking the acknowledgements of deeds by married women" and "certifies that he has examined Ann Hollingsworth apart from her husband touching her knowledge of the contents of the deed and her consent thereto and declared the same to be freely and voluntarily executed by her". The indenture of 1 July 1892 records that Hitchcock paid the £400 to Henry Morley (George Morley's son) by borrowing it from Joseph Swanwick, at 4½%. An endorsement records that Joseph Swanwick died 8th April 1906 and Bedford Skinner Hitchcock repaid the mortgage to his executors Henry Swanwick and Herbert Morris on 30 October 1906. The Swanwicks were farmers in Bingham and appear on a number of deeds as lenders or trustees. The next day, 31 October 1906, B S Hitchcock mortgaged both properties to Francis Brailsford, a pawnbroker of Hucknall Torkard for £450. In 1903 Edwin Hitchcock bought number 1 Market Place for business and residence. He was clearly doing well. His son carried on the business there and it closed after his death in 1972. The 1892 conveyance from Philbrick and Morley to Hitchcock is endorsed to record the sale, but not the price, on 20th August 1920 of number 6 to Fred and Sarah Scothern (née Hitchcock). This is the first time the ownership of the properties had been split. On the 21st August Bedford Skinner Hitchcock (now aged 78) sold number 4 to his son Fred Hitchcock for £250. Fred also agreed to pay the outstanding mortgage debt of £200. The other £250 owing to Brailsford had presumably been covered by the sale of number 6. Fred is already in occupation of number 4 - having taken over the business as he is described as a shoemaker and Bedford as a retired shoemaker. The properties having been split it was now important to establish various rights, such as ownership and right of way of the two halves of the passageway and use of the soft water cistern serving both properties. This was done in the 1921 conveyance. It is interesting to note in the overall Bingham context that the ownership of the adjoining land is now with Sam Foster Blood (publican) not the Earl of Chesterfield as it had been. It is noted as 'formerly' in the ownership of the Earl of Carnarvon, whose father had inherited through marriage. The 5th Earl of Carnarvon had sold a number of freeholds in 1920 this seems to be another. We think it was to raise funds for his archaeological work in Egypt in connection with the discovery of the tomb of Tutankhamen. He died in 1923 and the estate passed to the Crown in lieu of death duties. The remaining mortgage of £150 (Fred must have paid off £50) was assigned by Brailsford to Allcock's, a Nottingham firm of solicitors, on 3rd February 1933. Fred Hitchcock redeemed it on 10 September 1934, and on the 12th he mortgaged the property with Nottingham Building Society for the same amount! Fred borrowed another £20 from the building society on 8th May 1936 and £10 from Allcock's on 13th August 1938 which was repaid on 10 October 1938 by Annie Alice Hitchcock, spinster, presumably his daughter. As Annie Alice Miles, she sold the property to Mr and Mrs Favill. The photograph below was taken in February 1973.